I can't find any way to download PQ's in the new app. Is that feature no longer supported? If not, is there a way to convert a PQ to a list? How about .gpx to list? Gpx to list would be most awesome, as I often start with a PQ route then choose select caches to make a gpx file for download into my GPSr. I have some things I'm missing in the new geocache app. - It's cool that there are now the fieldnotes in the app. Would it be possible to send all fieldnotes at once? - What I miss the most: If i chose one cache i would like to see the difficulty directly on the first infobar under the map. So I don't have to "open" every cache to see how difficult it is. Ability to Log "Needs Maintenance"
I use the Personal Cache Notes page all the time at home and in the field for mystery caches, multi-caches, and just writing notes about a cache. And while in the field, the ability to scroll through all the pictures at once (so you don't have to scroll through all the logs in order to see all the pictures) is really nice. I love the recent addition of the drafts, but the ability to send them all at once is a must. After going on a long cache run, it is quite frustrating to have to sit there and send each log individually. I have been caching since 2001, but it was the old iPhone app that really got me going in finding caches. Not having to upload waypoints to a GPS and having access to all the caches close by anytime, anywhere was great! Knowing the old app (which I paid for ) is retiring, I have tried to ween myself off it, but I still find myself going to it almost every time I go out caching to access the personal cache notes and scrolling through the pictures. I guess I will be using my web-browser now that the old app will be completely shut-down tomorrow ! One of your wishlist items is already there! Did you read the February 8th Release Notes post? That post gives instructions of where to find the NM log. Again, Personal Cache Notes, PLEASE! And of course, the ability to download them for offline usage requested as well. PERSONAL CACHE NOTES, especially for the puzzles. PLEASE, PLEASE, PLEASE PUT THEM ON THIS NEW APP! Cache notes will be in our 5.3 release, which should be available in several weeks. Me too!! I miss my souvenirs! All have recently logged into the site, none of you look at your profile page anymore? Just curious, as I didn't think (maybe incorrectly now...) that the app, meant to search for and logs caches, was a replacement for the site. These days, those who discover geocaching by downloading an app probably won't even realize that there's a big website in behind it with lots more functionality/resources available to them. With the ability to buy a premium membership through the app, a member can go a long time without ever finding a reason to discover the website. My nephews have to keep reminding me they don't have email. - The odd thing (to me) is two have "stuff" on their profile, so I'd think they'd wanna look at it sometime. adding to the wishlist: the possibility to filter caches on basis of #favorites? Until they try to hide a cache. They'll realize they have to use the website to create the cache listing, and then they'll say that the app should support cache hiding. When are we getting attributes on the app? A new cache was listed just yesterday with the hint, "check out the attributes". Yes, I can do it while browsing the website, but I have the app for a reason. It should be a one-stop-shop, but it isn't. I liked the old app so much better; you could check out your souvenirs, too. Yes, I can do it while browsing the website, but I have the app for a reason. It should be a one-stop-shop, but it isn't. We see that new features are added at times. But I'd prefer that GS get out of the “App-making” business, except for a basic “intro” App for very new users to test how “Geocaching” might work. Probably the best plan for Groundspeak would be to make the “Official App” as light as possible, so that new users can try out “Geocaching” without needing the most updated smartphone. And maybe it could be an ad for the paid membership. If the App were an extension of the web site as a “compass”, that might be cool. It's not difficult today to switch to a compass App using either the IOS or Android web browsers. If you can find a cache on the phone, don't duplicate the feature in another App, don't make the the App do what the “web browser” does. Except for certain offline functions, and maybe extra info on how to decide what kind of equipment to choose (APP? Handheld hiking GPSr? Pros and cons for each? ), what “the App” needs is a way to direct the cacher to a selected cache. The cool online site features are on the site, on the phone right now. And maybe the “Official” (Intro/Demo) App doesn't even need “offline functions”. There are a bunch of Apps by third parties, free and paid, for various phones, and “phones” are not ideal for everyone anyway. Let people choose the device and the App that works best for them, or no actual “App” at all. Using a handheld GPSr, I'm doing just fine without any “App Updates”, and “no App at all” would be a fine plan for many Geocachers, for a lot of reasons. Make it as great as any other company's App when a given company that already has a full-featured web site, has published an “App”. That is, it's just an ad for the company. Regular members don't even use such an “App”, and don't require “new features” be added to it. Members might find a third-party App that suits, but mainly use the web site as always. Cross two more items off the wishlist! I just downloaded v5.3 of the iPhone App, and it now has a settings screen. It felt so good to turn off the "You're Getting Close!" notification popup. And, while not important to me, I know that geocachers in other countries will appreciate the setting for units of measure. 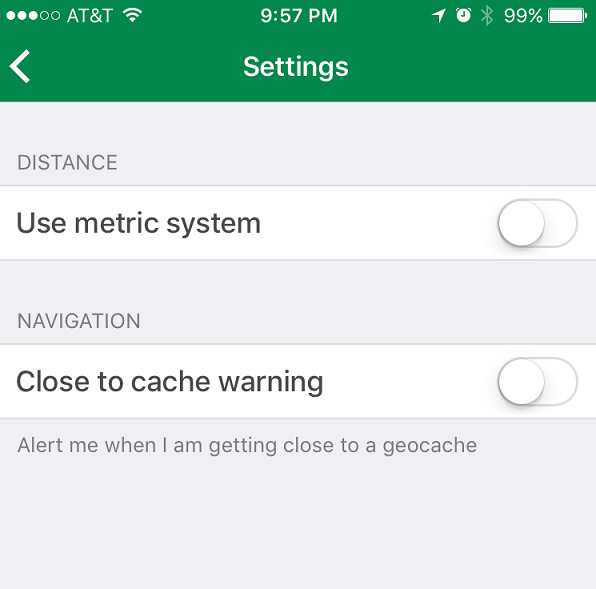 Popup alert for the Geocaching HQ Mobile Team: "You're Getting Close!" Proper release notes for 5.3 coming tomorrow. And there's a third item, which I know a lot of cachers are going to be thrilled about - especially those that have complained about the discontinuation of the Classic app. I've been waiting for the new Release Notes before mentioning anything in the forums though. Since this thread seems to be the de facto for adding things we'd like to see in "the" app (whether iOS or Android) - one thing I'm missing is a map scale. I'd like to be able to look at the map and estimate how far it is between 2 points. Right now, I can click on a cache and see how far that icon is from the blue dot that represents my location, but I'd need a scale on the map to estimate the distance between 2 icons on the map. Road routing option or option to send the destination to another mapping app that can route. This is already available - just start navigating to the desired cache or waypoint, then tap the "right-turn arrow" icon at the top of the map and select from the available routing applications. I find this feature very handy, and would like to request support for navigation apps that support offline navigation. I would love to have view photos back, it's too hard to scroll through activity and logs.... I find the gps accuracy is not quite what it was with the old app. I find the gps accuracy is not quite what it was with the old app. GPS accuracy isn't a function of the app, it's part of the phone/operating system. All the app does is use what the phone's operating system is reporting your location as. There should be no difference in location accuracy when switching between apps. Update to the latest version. It now has a setting to disable the "You're getting close" notice. I hate the new app. How can I search of geocaches by NAME and byGEOCAHE OWNER. I use the name search all the time. PLEASE, PLEASE ADD THIS BACK. After last update missed Czech localization. What I do miss is when useng the map screen the option to switch to the map rotation of the direction i'm heading for. It now only uses North up. hope it will be implemented soon. You can do this now! Tap the "target" icon at the top left of the map twice. It will turn into a green compass icon indicating that you're in track up mode. (1) The ability to view the gallery of images for a cache rather than scroll through individual posts on the 'activity' page to find any associated images. (2) The ability to edit and/or delete log postings. I've just come back from a three week vacation where I posted an image with each cache I found only to realize after the fact that the images never loaded with the log entry. Rather than now having to download images to my laptop and then upload to my posts (not really that big of a deal but...), it would be nice just to go back via the app and update each of my posts there. 1) I would have loved to filter caches by the number of favorite points. Vienna, Austria has a ton of caches and it was overwhelming trying to find the good ones to visit with the time I had. Being able to filter by like 500 favorite points or above on the map view would have quickly let me see what caches I had to visit while in Vienna. I just now figured out I could switch the map view to list view and sort by favorite points but it would have been super nice to also filter the map view by favorite points so I could see where the caches where easily and plan out an attack plan without getting distracted by caches with less than the desired favorite points. 2) I also wanted to quickly find caches that had travel bugs in them so I could take some home to the USA. Some way to filter or highlight caches that have travel bugs would have been great. Similarly, it'd be great if I could search for Travel Bug hotel caches. 3) It'd be great if we could log a find and a trackable at one time. Right now, I'm using the app to log a find, and then going back to the cache page, viewing the inventory, toggling to my inventory, and logging a trackable there. I love how the website lets you just log a find and a trackable in the same log. Super convenient. Is there a better way to do this in the app? Thanks for the app! It took me to a lot of neat places in Europe I probably would have otherwise not found. Having the app on my phone lets me find caches quickly and easily without having to do much planning and works great for these business trips.